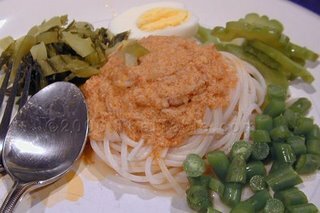 Kanom Jeen Je is a menu for vegetarian and most famous of Thailand local, it’s easy for cooking and delicious. And then use in period Kin Jay festival. That is good idea for Vegan. 1. Boil Dried Kanom Jeen for 8 minutes. Rinse in temperature water to make it less sticky. Drain well. 2. Dissolve butter in a wok, add chopped onion. tomato stir-fry till fragrance, and add tofu fry till cooked. Add tomato and chili sauces stir-fry and pour soup into a wok mix well, season with sugar and salt. 3. Top mixed soup as step 2 over Kanom Jeen. Serve hot.